So, the day has finally arrived! VuLiv Player v5.0 is now available for you all on Playstore. And there is something amazing about the update, we’ve introduced VuShare. VuShare is a first of its kind media player experience where not just you but your friends can also enjoy your videos on their phones, obviously, with your permission. This is done without internet and even without transferring files, sound amazing, right? We thought of taking the experience 1 level up, your friends can even download the videos without internet, without transferring files. Other than VuShare you can now also check for real time weather updates with VuLiv Player and plan your day accordingly. Just pull the side menu out and you have live weather feeds on your phone. Now get rid of the extra apps and save some extra space to create more memories. Oh, by the way, we thought of making the experience of organising your memories even better. Now tag your photos and videos and find them instantly. All you need to do is, go to search bar, enter the tag and get instant results. 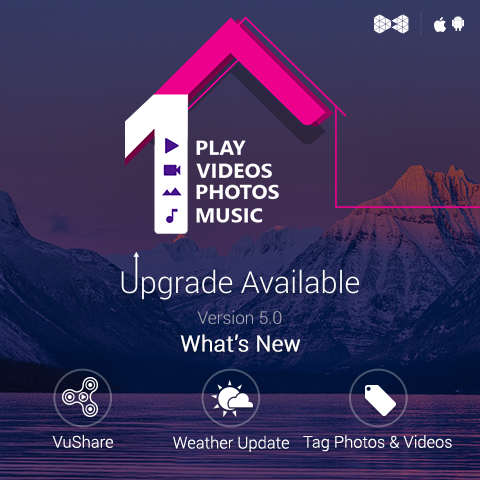 So what are you guys waiting for, go ahead upgrade your version of VuLiv Player to version 5.0 and experience a whole new world of entertainment.